Before World War I, Europe had been relatively peaceful for over 40 years. The last major war had been fought in 1871, meaning that a whole generation of young men had grown up with no real experience of war. The same was true of Australia. Apart from a small number of soldiers who had fought for Britain in the Sudanese and Boer wars, Australians had not been engaged in war and had little understanding of what it meant. Possibly because of this, there was a perception that war was glorious, exciting and heroic. Young people, especially boys, were brought up on military stories and were taught military drills in school. In these stories, the heroes were rarely wounded or killed; they won their battles effortlessly, and the drills taught them to obey orders and work together. When World War I began, Australia had been a single, united country for only 13 years. Although Australia was self-governing, it was still a dominion of the British Empire. As such, Australia was obliged to follow the instructions of Britain in many areas of government. Therefore, when Britain declared war on Germany, Australia was also at war, as were all other countries in the Empire. In Australia, a wave of enthusiasm for the war effort swept the country. The men of Australia rushed to enlist in the Australian Imperial Force (AIF). According to legend, many were concerned that the war might end before they got to Europe. The Australian government initially promised to supply 20 000 men to the British war effort by the end of 1914—in reality, the number of men enlisted by this time was around 50 000. The reasons for enlistment were varied and complex. Some men were driven by a desire to show what this new young nation could contribute to a world conflict. Others went to war because of pure loyalty to Britain, ‘the mother country’. Many of the first wave of volunteers were former British soldiers and other British citizens who happened to be in Australia. Still others wanted to show support for Britain in case we should need Britain’s help at some stage in the future. Leader of the Opposition (later Prime Minister) Andrew Fisher pledged that Australia would ‘stand beside the mother country to help and defend her to the last man and the last shilling’. As well, there were young men who joined out of a spirit of adventure, an opportunity to leave home, to see the world, to meet French girls. Whole football and cricket teams joined, as did groups of workmates from businesses and factories in cities and country towns. Many women encouraged their husbands, boyfriends, brothers and even fathers to enlist. Many young women preferred to socialise with men in uniform. The opportunity to earn a good income also acted as an incentive. The pay was 6 shillings (60 cents) per day, a figure calculated to match the average wage of Australian workers, minus the cost of rations. The promise of regular pay also motivated many unemployed men to volunteer. As the war progressed, hatred of the enemy also became a motivation for enlistment. Propaganda stories (often exaggerated) of German atrocities were used in recruiting campaigns. In every city and town, recruiting rallies were held. Platforms would be set up with the Australian and British flags side by side as a backdrop to the speeches. High-profile sportsmen such as footballers, cricketers and athletes would be planted in the crowd. When the call went out for young men to step forward and sign up, it was frequently one of these sportsmen who led the charge. Among those who offered to enlist were Aboriginal Australians. Only 400 Aborigines were accepted for service, and they were all deemed to be ‘of substantial European origin or descent’. When Australian soldiers returned from World War I, there were many benefits available to them to assist their readjustment to civilian life. Aboriginal soldiers, however, were denied access to these benefits. Of course, not all motives for joining the war effort were noble. There were stories (perhaps just rumours) of soldiers changing their names before enlisting in order to get away from their wives or other commitments. Others enlisted to escape the boredom of jobs they hated, to leave school early, or to escape the strict rules and confines of their family homes. Those who had fought in the Boer war had some understanding of the brutality of war, but for most, war seems to have meant adventure. Of all the thoughts that ran through the heads of those who enlisted, particularly in the first few months, the idea of death or even injury seems to have been very much in the background. Not all Australians were enthusiastic about the war. Some argued that it was not Australia’s war and that a force from this young country could make little difference to the outcome. Others were opposed to the war because they were pacifists—people who do not think violence is an answer. One group of pacifists were the Jehovah’s Witnesses, a religious group for whom any engagement in war went against their beliefs. There was also a small group of conscientious objectors and pacifists- people who oppose war and believe that they would betray their principles by enlisting or fighting, or by supporting war. Among this group was the Women’s Peace Army, led by suffragette (a woman demanding the right to vote) Vida Goldstein (Above). Some Australians did not enlist because they were afraid, or because they believed it was to their economic advantage to remain at home. Little has been recorded about these people. Often those who were reluctant to go to war used excuses such as poor health or family responsibilities to explain their decision not to enlist. Taken together, however, all of these questioning groups seem to have made up only a small fraction of the total population. In 1914 and through most of 1915, the dominant feeling towards the war was positive and supportive. It was only as the harsh reality of war became known that some Australians began to question their initial enthusiasm. 1. 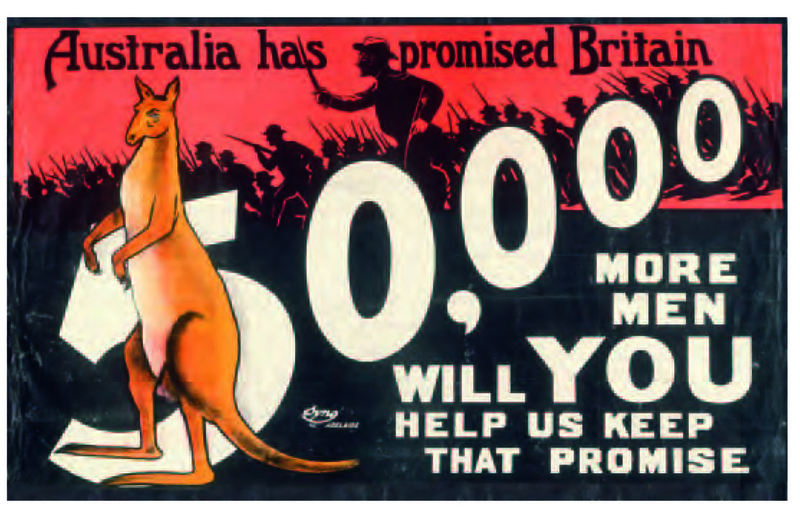 What was the attitude of most Australians to war before 1914? Why did they hold this attitude? 2. Why were some people or groups not enthusiastic about the war? 3. What techniques were used by the government to encourage men to enlist? 4. Why did recruiters rely on a sporting image to encourage young Australian men to enlist? 5. Examine the two recruiting posters above. 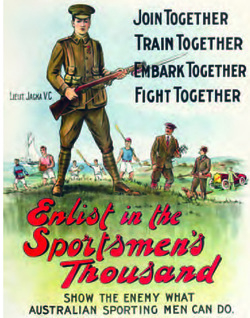 Identify all the methods used on these posters to encourage enlistment. 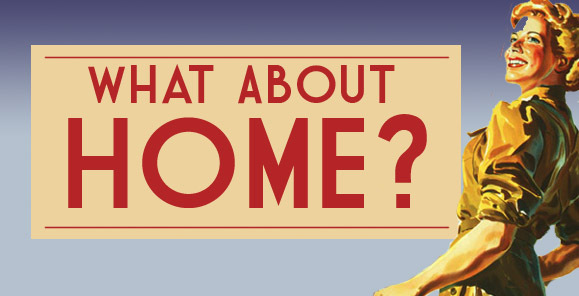 Support your answer with reference to words or images in the posters. 1. How many different motivations and attitudes can you identify? 2. What other reasons might have motivated men to enlist? 3. Create a conversation between the unnamed soldier in Source 5.17 and a younger brother who has been left to run the farm alone. Your conversation should include three arguments 'for’ and ‘against’ enlisting in 1914. Video 07: Australians at War "Who'll come a fighting the Kaiser"
Episode 2 of the series Australians at War includes a sequence showing the landing at Gallipoli by the Anzacs on 25 April 1915. The sequence does not include any actual film footage of the landing – there were no cameras there. The sequence creates an impression that this is a record of the event, but it is a representation created by the film director. He has done this by his use of a variety of elements in the film. Do you think the Gallipoli landing sequence is an accurate and effective representation of history? Write 300 words. The first major battle of World War I for Australian troops took place on the Gallipoli Peninsula in Turkey. Many Australian men who enlisted in the early months of the war believed they would be travelling to Europe to fight against the Germans. However, in October 1914, Turkey entered the war on the side of Germany. British strategists decided that Australian and New Zealand soldiers should join the Gallipoli campaign, which was designed to knock Turkey out of the war as quickly as possible. For eight months, from April to December 1915, the Allies continued to fight on the Gallipoli Peninsula, but the campaign was ultimately a failure. As a result, the majority of Australian soldiers were moved to the Western Front. There they engaged in trench warfare for the next three years, until November 1918. Australian troops who remained in the Middle East, mainly the Light Horse, continued to fight the Turks, especially in the Australian and Anzac Mounted Divisions and the Imperial Camel Corps. When the war began, there was an equally enthusiastic response from Australia and New Zealand. Initially their two forces were separate. The Australian troops formed the First Australian Imperial Force and the New Zealanders the First New Zealand Expeditionary Force. Early in 1915, as the two forces were training in Egypt, it was decided by General Birdwood, commander of the Australian and New Zealand forces, to form a combined corps. The first name suggested was the Australasian Army Corps, but this was rejected by New Zealand. Eventually the title Australia and New Zealand Army Corps (or ANZAC) was adopted. It was under this banner that the soldiers of both countries fought at Gallipoli and throughout World War I. The first major engagement of the Anzacs was as part of a campaign that aimed to take the Ottoman Empire (Turkey) out of the war. The plan was to open up a supply line from the Mediterranean through to Russia. The only way that Britain and France could move troops, equipment or armaments to their ally Russia was through the Mediterranean Sea and into the Black Sea. To do this they had to pass through Turkish waters (see the map above). The first part of the campaign plan was launched in March 1915. This involved a naval attack through the Dardanelles—a sea passage from the Mediterranean Sea to the Black Sea. This action failed because the entrance to the Dardanelles had been mined. Three Allied battleships were destroyed by these mines, and another three were badly damaged. A plan was then developed to launch a land attack on the Gallipoli Peninsula from the Aegean Sea coast. The hope was that the Allies would surprise the Turks, defeat them quickly and then march on to take control of the Turkish capital, Constantinople (now Istanbul). This would open up the desired supply lines through to Russia, and help the Allies to fight Germany and Austria from the east. Conditions at Gallipoli were extremely difficult. The Allies landed in the Turkish spring. A sweltering summer followed. The bitterly cold winter would really take its toll. For men used to temperate Australian conditions, the icy north wind and snowfalls cut right through the meagre protection offered by inadequate uniforms. Frequent rainfalls flooded the trenches and turned the battlefields to mud. Despite the rain and snow, drinking water was in short supply. It had to be shipped in to the troops, and this could be difficult if a supply ship ran into problems. Water was rationed carefully and soldiers were so conscious of the shortages that they often shaved with leftover cold tea. Food was more plentiful, although lacking in variety. Rations commonly included canned meat, corned beef (called ‘bully beef’) and hard biscuits. Fresh food was rarely available. Poor health was a major problem. Painful conditions and diseases such as trench foot, dysentery, diarrhoea and gastroenteritis were common in the damp conditions of the trenches. Illness was spread by rats, lice, flies and mosquitoes. Many pests were attracted by the strong odour of decomposing bodies and human waste. Poor sanitation and poor food-handling practices meant the germs were often transferred to food and water supplies. In December 1915, the Anzacs were finally ordered to withdraw from Gallipoli. To hide the fact that they were leaving, they rigged up some rifles to fire at random. They did this by attaching tins to the rifles’ trigger mechanisms with string. When the tins filled with water dripping from other tins suspended above, their weight caused the triggers to be pulled and the rifles to fire. This tactic became known as the ‘ghost guns of Gallipoli’. Soldiers also carefully wrapped the horses’ hooves in cloth to muffle the sound of their leaving. The last Australian soldiers were evacuated overnight on 19–20 December. Because of its efficiency, the silent withdrawal is usually remembered as the most successful part of the Gallipoli campaign. Over the course of the campaign, 8709 Australians died, and 19 000 were wounded. Over the same period, over 80 000 Turks were killed. During their time on Gallipoli, the ‘diggers’—as Australian troops became known—displayed a courage and ingenuity that would form the basis of the Anzac legend. 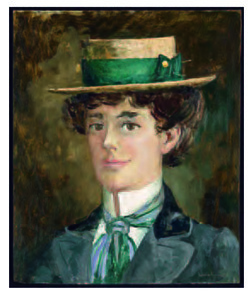 This legend would contribute to the Australian sense of identity over the course of the 20th century. What was the aim of the Gallipoli campaign? Give two reasons why the campaign was unsuccessful. Why do you think the Australian soldiers earned high praise, even though they did not achieve what they hoped to? What attitude does Peter Weir have towards war? How do you know? Give an example of his feelings (shown through his construction of images of war) from one of the scenes you have viewed. What are some of the images of war that have been used to convey the conflict/situation the Australian soldiers experienced during the Gallipoli campaign? 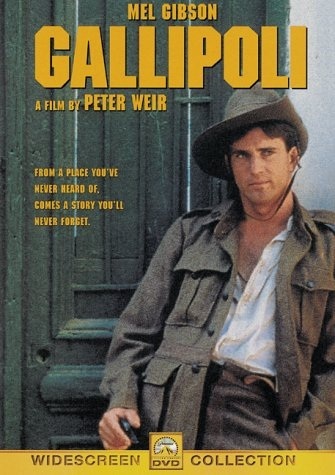 Do you think Peter Weir's film is objective or subjective in its account of the incident at Gallipoli? 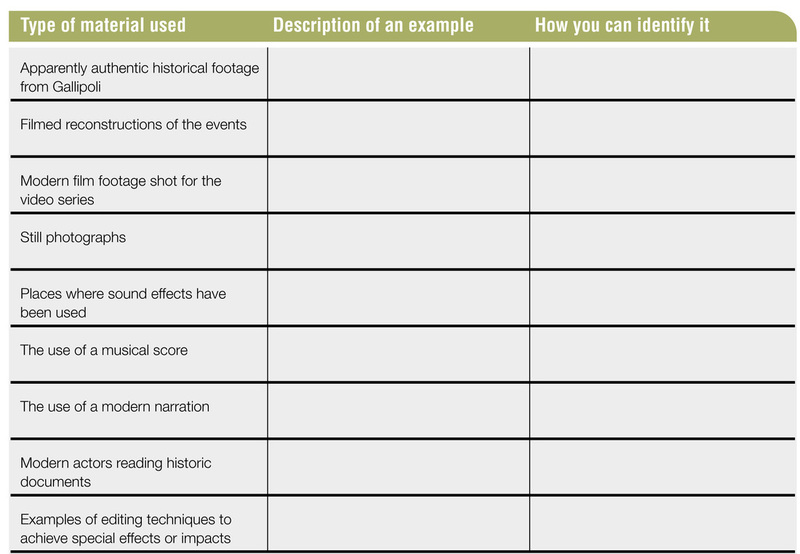 Explain with examples from the film. In the film why were the soldiers given such an impressive farewell? 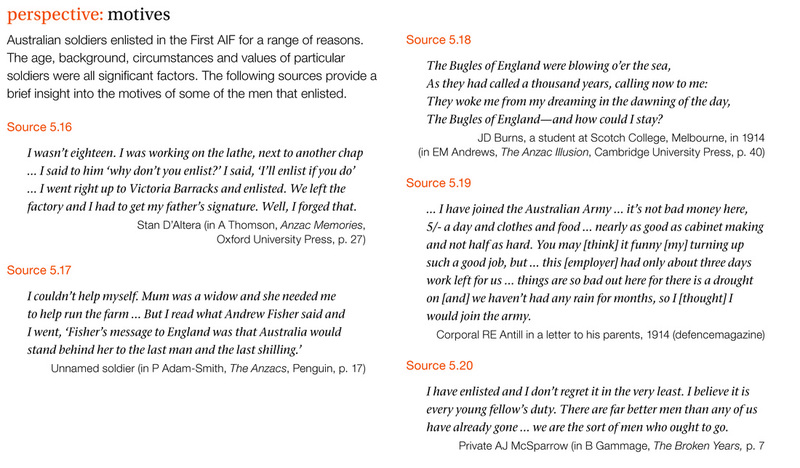 Did the soldiers in the AIF appear to respect the British? Why? Following the withdrawal from Gallipoli, the Australian infantry were deployed to France. However, the mounted troops remained to continue fighting against the Turks in Egypt. They became involved in what was known as ‘the Sinai and Palestine campaign’. The Australian Light Horse was a combination of cavalry and mounted infantry that had been developed during the Boer War (1899–1902). Traditional cavalry forces were becoming obsolete as nations developed more powerful infantry and artillery weapons. However, Australia’s vast distances made military leaders reluctant to do away with mounted soldiers. The answer was a mounted force of trained infantry soldiers who would ride swiftly into battle, but fight on the ground like regular infantry. Australian mounted troops made a significant contribution to the defeat of Turkish troops in the Middle East. The most famous battle fought by the Light Horse was the Battle of Beersheba in October 1917. 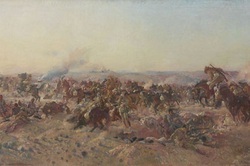 The charge was aimed at capturing the important Turkish base of Beersheba, and has been called the last successful cavalry charge in history (see the image above). Australians fighting on the Western Front between 1916 and 1918 were engaged in numerous battles that were to earn more than 50 Victoria Crosses for the soldiers who participated. Australians again distinguished themselves in battle and earned a reputation for courage and toughness, especially in 1918, under the leadership of General Sir John Monash. There was also terrible loss of life. In battles along the Somme, and at towns such as Passchendaele, Villers-Bretonneux, Ypres and Amiens, thousands of soldiers were killed or wounded, often for little gain in the futile ‘game’ of trench warfare. Two of the most destructive battles involving Australians were at Fromelles in northern France in 1916 and at Bullecourt, closer to Paris, in 1917. At Fromelles, an attack on the German trenches was designed to draw German attention away from an onslaught on the German lines 80 kilometres to the south, on the banks of the Somme River. The attack was unsuccessful and the cost was terrible. In one day, 1917 Australian soldiers were killed and over 3600 were injured, some to die later of their injuries. This event has been described as ‘the worst 24 hours in Australia’s entire history’. Because the Germans quickly regained any territory they had lost, the Australians had no opportunity to bury the dead. The Germans buried many in mass pits. During the 1920s, most of the bodies were reburied in Commonwealth War Graves cemeteries, but one mass grave remained undiscovered until 2007. In that year, as a result of painstaking research by war historian Lambis Englezos, a burial site was identified on the edge of the town of Fromelles. It has since been confirmed that up to 400 Australian soldiers are buried in this mass grave. 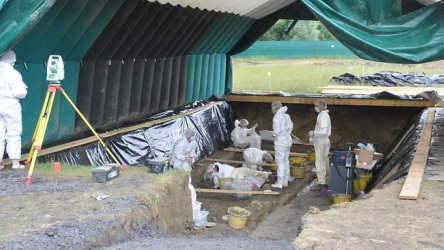 The process of identifying these soldiers and preparing them for reburial (see the image above), with full military honours, in a newly built cemetery is slow and delicate. Up to 75 soldiers have been positively identified so far through the use of DNA technology.